It still amazes me how many cup holders exist in today’s cars. I have an SUV. There are two in the front middle, one in each of the four doors, two more embedded into the rear seat armrest and another two in the back where I have a third seat that we used once just to see what it felt like to sit in it. That’s ten cup holders. Who drinks that much water? Using one (or more) to mount your phone, tablet, satellite radio or GPS seems like the logical thing to do. A cup holder mount typically consists of three components. The expandable base will typically expand to fit almost any size cup holder, there is a an adapter or cradle for your device, then normally some sort of extension to connect the base to the cradle. Before selecting a cup holder, measure the diameter across the cup holder and make sure that what you select will expand to fit the width. Second, determine how high of a reach beyond the top of the cup holder you would like your device to be. If you have a tablet, don’t forget to factor in the size of your tablet. Thirdly, if you will be buying a car cup holder mount with a universal cradle, measure your device to make sure it will fit. And lastly, be sure the mount swivels your device into landscape and portrait. After purchasing your cup holder mount, installation is typically a five minute activity. First, make sure the cup holder is clean and there isn’t anything in the cup holder. You will then adjust the base. You will adjust the base by typically turning a knob or wheel, it will vary depending upon the brand that you have purchased. Make sure that the sides of the cup holder mount have expanded extremely tightly to the cup holder. Failure to do that means your mount may tip over with the first wide turn. Next you will install the cradle. Most cradles have one to four slots on the back that will fit over a series of forks on the mount. Push it down tightly onto the mount. You can then install your device into the cradle. Orient the cradle and adjust the mount so that you will not have to do this while driving. Place it an angle that is easy for the user to see. Try interfacing with it so that you can be sure that when you touch it, that it will not move. For specific recommendations, it depends upon the device that you are trying to mount, but here are a few good ones for you to consider. If you are thinking about buying one for a phone, consider the iKross Car Cup Holder Phone Mount. The cup holder base is expandable from 2.7 to 3.7 inches. It will fit almost any vehicle’s cup holder. There is a 12″ flexible stem that allows bending of the mount to the right angle for the driver or passenger. The phone can rotate 360 degrees into portrait or landscape and is easy to insert and remove. The expandable cradle opens to 8 inches so it will fit your phone with or without a case or skin. Moving into the tablet space, take a look at iKross cup holder mount. These mounts serve a dual purpose in that it includes cradles for both a phone and a tablet. The mount is adjustable and solidly made to easily handle the weight of your tablet. You will see a lot of mounts on the market for tablets or cell phones. This is the only car mount kit that I know of that offers two different cradles, one for the phone, the other for the tablet. You will not find a universal cradle that fits phones and large tablets. This is a good value given the fact that two cradles are included. If you would like to mount a satellite radio in your cup holder, consider the Arkon SR123 Universal Flexible Cup Holder Mount for XM Sirius. 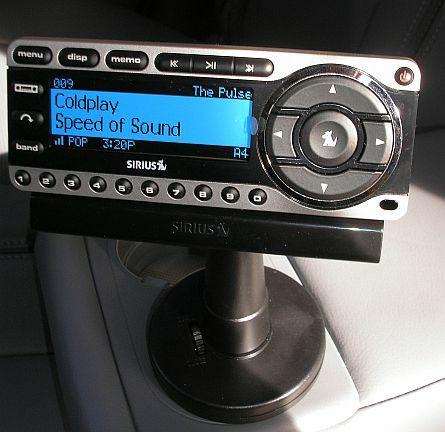 These mounts include an AMPS adapter plate that has the holes and screws needed to attach to the back of your Sirius / XM radio. The cup holder mount has a flexible gooseneck stem to permit tilting the angle up towards the driver.